And a reminder that we Belong to each other. Today we return in communion and in welcome. May this service become a vessel that holds all that we call Holy. find solace in our gathering today. invites us to consider what it means to be in Community. ….we can only catch glimpses of from time to time. without having the words catch in our throats. voices will celebrate with us whenever we come into our own power. to do the work that needs to be done. Arms to hold us when we falter. Finding rest in the cool stillness of shadows, and moving to the slow heat-struck rhythms which turned the long hours of summer light. Now it is time for gathering in. We come together at this time and in this place on the bridge of autumn. Summer is fading backward into memory, and winter waits in snowy brilliance. We meet with eagerness and delight, needing one another for sharing. Things that we would like to understand, ideas waiting to be heard. and searches together with courage and love. Imagine this room as a Lake. intertwined on our journeys and experiences. a great Ocean of all that is Living and Loved. The Ocean – Our Source. And we – the Waters of the Rivers Coming Home to Her. If you brought water with you today, please take the vessel in your hands. If you did not bring water, please cup your hands and envision holding beautiful pristine water. Let us bless the water we hold in our hands. all our triumphs along with all our fears. Please come forward if you wish and pour your water into the vessel. Feel free to share a word or a sentence about why the source of the water is of special significance to you. and may we be blessings to each other. The Winds of Summer beckon us forward to welcome the incoming of the Season’s end. Reminding us that it is Time once again to gather in. and where we can be free. and arms will hold us when we falter and when we need comfort. Where we can work together, and explore together. Community, and that which we call Holy. That which, like water, can have many forms and qualities. that which would otherwise be parched and wanting. surrounding us in mystery and wonder. and live deeper into our faith. to hold our most sacred intentions and experiences. And we do so in union with congregations throughout the Nation. 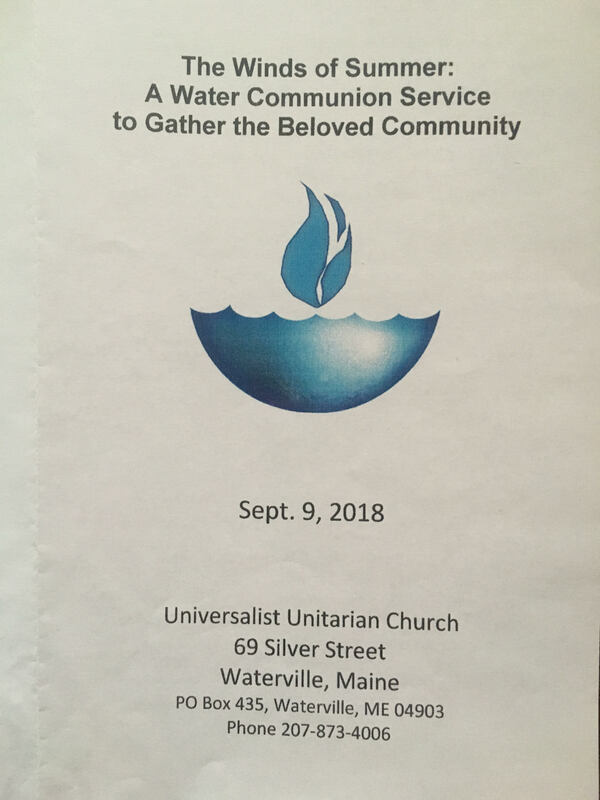 and the UUA Administration in which all Unitarian Universalists (UUs) were invited to discover our common aspirations and unleash the power of our faith. Many responded! “We Unitarian Universalists envision a life filled with compassion for all, shared in beloved community, and lived in a just world. shape the future of Unitarian Universalism. of active benevolence and genuine compassion. As UUs we are not bound by denominational doctrine and dogma. 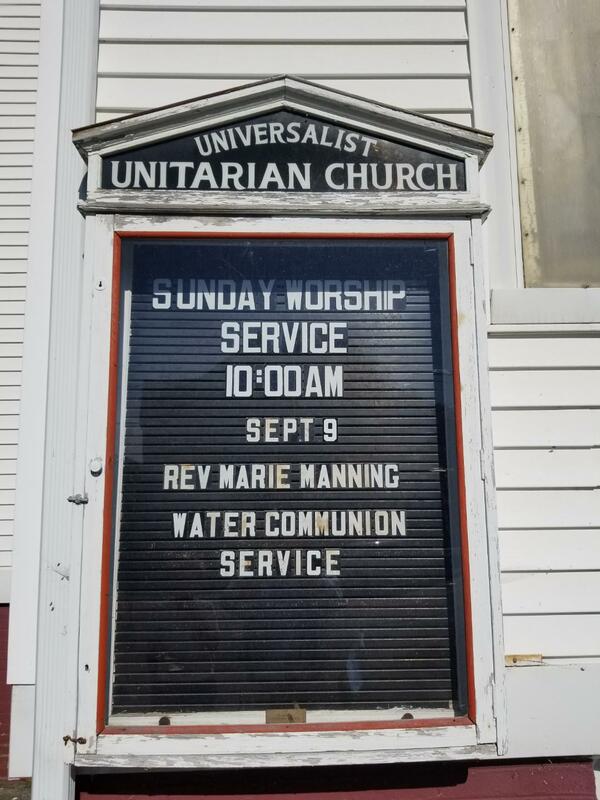 and, to also be claimed by Unitarian Universalism. Yes, claimed by the faith we hold dear. Our vast umbrella of UU sources houses many paths of religious and spiritual exploration. each person on their journey towards home. driven out of Earth’s popular religions, including ours. 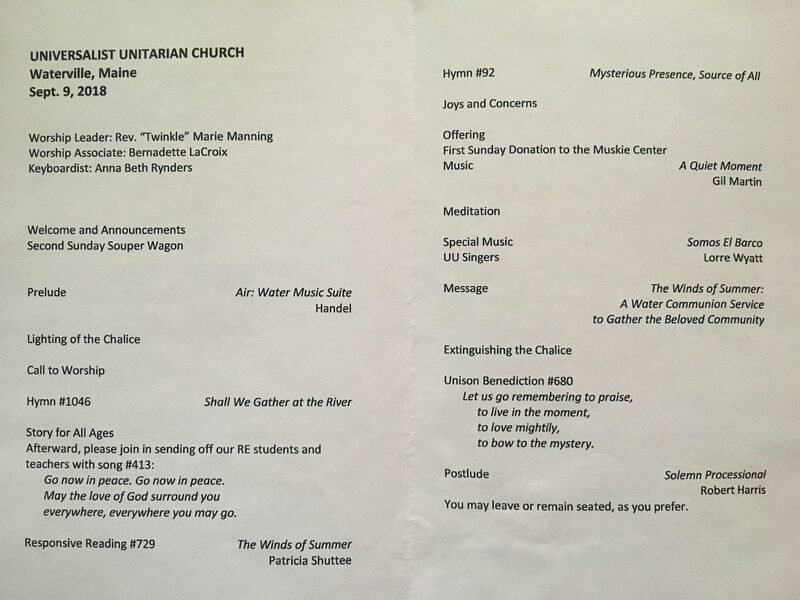 of Unitarian Universalists in East Lansing, Michigan. Almost two decades later, it was printed for distribution at the 1997 General Assembly of Unitarian Universalists in Phoenix, Arizona. Since that time has morphed into annual ingathering services hosted by congregations throughout the world. Which was expected and anticipated by its creators as such would be in alignment with the ever-evolving Living Tradition of our the UU Faith. We embrace what feels good and feels right and enhance it. We make it our own. be in process, change, be in motion. Decades after its original creation, Carolyn, Lucile, Pat, Rosemary and the other women involved with the original ceremony expressed the value of the collaborative process it took to create the service. in the shaping of such a community. “Creating that service … brought us together for many hours of sharing and conversation, analyzing, planning, creating, clarifying. to pulling foggy-shaped thoughts into words. We each spoke and listened. We wrote down one another’s words. We spoke them back with added meaning. As they worked on preparing the service, their awareness increased about Water’s presence and deep meaning in our lives. Water became more than simply a metaphor. For it is elemental and primary. It calls forth feelings of awe and reverence. offering comfort and strength to one another. Here, we heal and we hone. to Build The Beloved Community. Knowing we are part of a larger family in fellowship. Like the Rivers to the Sea. and a willingness to be gentle with each other.